This is a walk best served hot. Preferably at the end of a long hot summer so the squelchy quagmire around the Ullscarf plateau has had a chance to dry out. I took a gamble today as it's been unusually dry in the Lakes over the past 6 weeks. 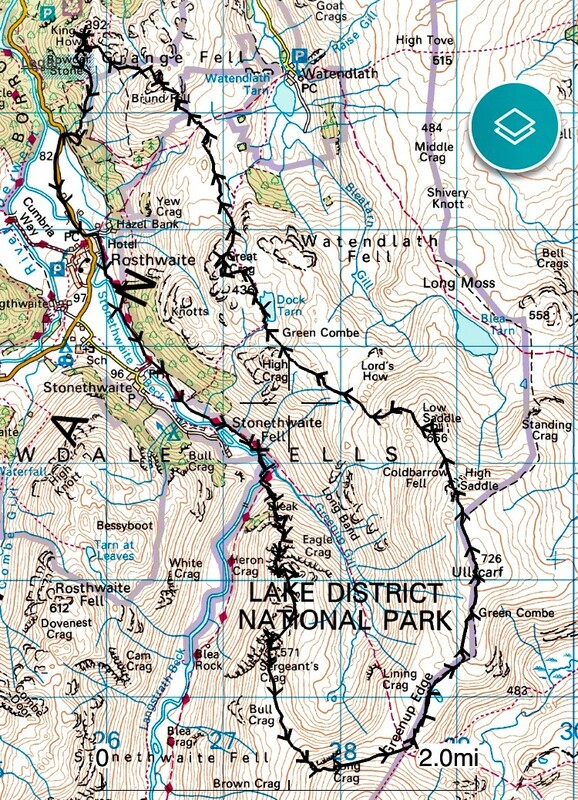 I parked near Rosthwaite and walked along the Cumbria Way as far the Langstrath valley, and then followed the dry stone wall steeply up the lower flanks of Eagle Crag. From this side, Eagle Crag looks steep and impenetrable but there is one line of weakness which Wainwright's pictorial guide illustrates in detail and which I had studied the night before. As is happens, the many feet that have since trodden this route have carved a path that is fairly easy to follow. The key to accessing the upper crags is a short, steep gulley which the book describes well. From the top of this gulley, a path then zig-zags along a series of heather clad terraces before emerging onto the craggy summit. The view is good in all directions but especially back down to Stonethwaite, and over to Sergeant's Crag. A well used path links Eagle Crag to Sergeant's Crag, as it would be criminal not to visit both summits. Seargent's Crag offers superb views along the length of the Langstrath valley and little grassy patch off to one side made a great lunch spot. I walked over the head of the Greenup valley and around to Greenup Edge before following the path up onto Ullscarf. The summit is a dreary flat peat hag offering reasonable distant views but the foreground is robbed of interest by the expansive plateau. From Ullscarf, Great Crag looks a long way away and the intervening landscape is undulating and difficult to negotiate. I decided to head over High Saddle and Low Saddle and then take a direct pathless route over the peat hags and grass tussocks towards High Crag. In anything but a dry spell, I can imagine this terrain being a boggy torment. Thankfully it was largely dry underfoot but it drizzled for most of the way, which was quite refreshing on this otherwise hot and windless day. An unexpected gem on this walk was the lovely Dock Tarn. It's a really picturesque little tarn made even more delightful by the clusters of white lilies in flower at this time of year. A short climb from the main path finds the summit of Great Crag. From up here it seems like a strange name as the crags don't appear particularly 'great'. They are hidden to the summit walker and visible only from the Borrowdale valley below. A more suitable name would perhaps be 'Heather Crag', as the summit is adorned with the stuff. For tired legs it's a morale sapping view over more undulating terrain towards Grange Fell, which looks a long way away. Unfortunately a larger degree of altitude than hoped is lost between Great Crag and Grange Fell but the walk is made considerably more interesting by the views over to Seathwaite and Great Gable. A steep climb up a good path finds the summit of Grange Fell, which confusingly is called 'Brund Fell' on the map. 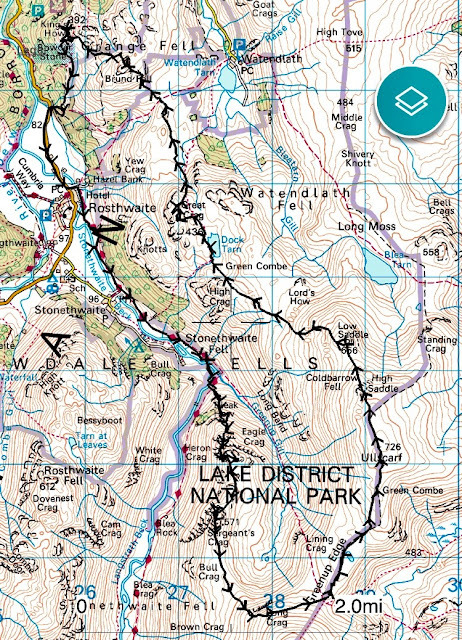 OS seem to describe Grange Fell as a triangular kilometre of high ground with 3 separate peaks at each point; Brund Fell, Kings Howe and Ether Knott. Brund Fell is the highest point and therefore represents the summit of Grange Fell. I thought I might pay a visit to Kings Howe on my way down as it didn't seem too far out of the way, and this fell is what most people assume is Grange Fell when seen from the road along the Borrowdale valley. A bracken invaded path then leads steeply down through the trees back to the road. I can image this would be lovely route upwards in autumn.